Late last month, the BBC put the complete audio archive online, which gives you access to 240 lectures in total. Where's the best place to start? 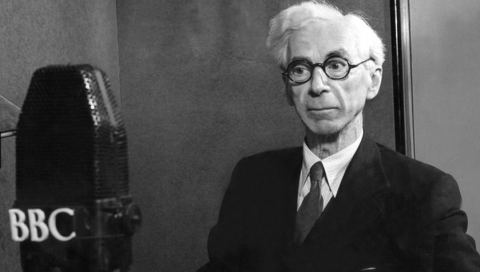 How about at the beginning, with the inaugural lectures presented by philosopher Bertrand Russell in 1948. His lecture series, Authority and the Individual, delved into an age old question in political philosophy -- the individual and his/her relationship with communities and states. The head of the BBC later groused that Russell spoke "too quickly and had a bad voice." But the real complaints came from the Soviets, who interpreted Russell's lectures as an attack on Communism. You can find the lectures here; the first lecture appears at the bottom of the page. Note: Our Twitter friends around the world said that they could almost universally access the lectures. If you experience any geo-restricting, we apologize in advance. Hey, you guys are doing a truly great job here.. I come from a pretty mediocre background, and to have access to these is a privilege and an honour. Thanks guys, and keep this going! Give me books over all good looks,give me cooks,not kitchen spooks! Great job keep working….. If I didn’t have the GI Bill I would live on this site. I have the Gi Bill and I live on this site. The Army was wasted on me. Thanks you Mr. Dan Colman for putting these free everything up online. This is a site that I will use again and again. This is an amazing source for information. Thanks again !!!! I can’t thank you enough for this site. I live among acres of corn and beans; access to books, works of art, etc. is difficult here. You are a window to the most enlightening and interesting productions of the human spirit. Merci ! Unfortunately, really? What was the purpose of this statement? Perhaps they should apologize? IAmerican men are so pathetic. Unlikely – Wollstonecraft died in 1797. The earliest photograph was taken in the 1820s and the first portraits very much later. Strange, can’t access any of these lectures here in Oregon, USA. It says it’s not available in my area.